Controls: Portamento, Three preset voltages selected by touch pads. ~~~possesses and encompasses all other instruments of music - large and small however names - in itself alone. If you want to hear a drum, a trumpet, a trombone, cornetts, a recorder, flutes, pommers, shawms, a dolcian, racketts, sorduns, krummornes, violins, lyres, etc., you can have all these and many more unusual and charming things in this artful creation; so that, when you have and hear this instrument, you think not but that you have all the other instruments one amongst the other. 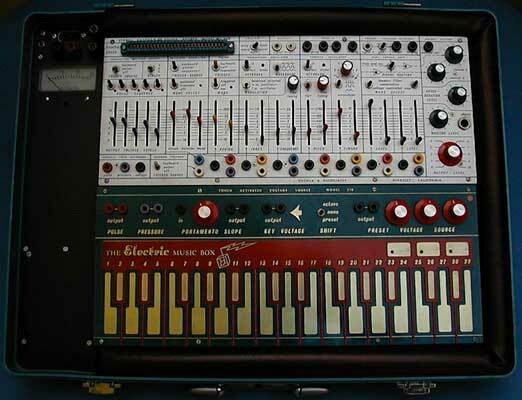 The Buchla Electric Music Box, also known as the Music Easel, was released by Buchla and Associates in the 1970s. It consisted of a Model 208 Stored Program Sound Source, a Model 218 Keyboard and a Model 214A power Supply integrated into a Model 203-08 briefcase-style metal case. The Plug-in card memory consisted of a PC board onto which resistors were soldered to define a patch. The board plugged into an edge connector on the panel upper left. The original cost was $2850. Click for large image of panel. Click for large image of PC board. References: A-Z of Analogue Synthesizers by Peter Forrest, 1994, 1996, Surreal Publishing. Programming and Metaprogramming in the Electro-Organism - An Operating Directive for the Music Easel by Allen Strange, 1974.